Do you want to know a secret? Want to know who is my FAVOURITE kind of client? The ones who say ‘I don’t know. Here’s the theme. You just design something, and make it fabulous!” #FAVOURITECLIENTEVER !!!!!! Tweet This Country Western Inspiration! Well, Cal Faber is that kind of client. 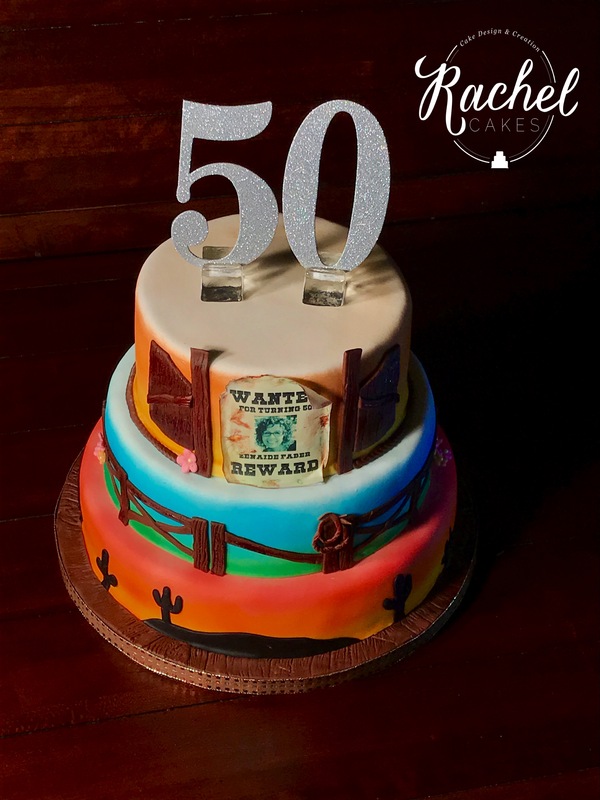 His wife, Zenaide, was turning 50 and he wanted to surprise her with a Country-Western themed birthday party at a local hotel. 1. I want it to be awesome; and 2. Here’s my budget. Being given free reign on a design actually gets my creative juices flowing. 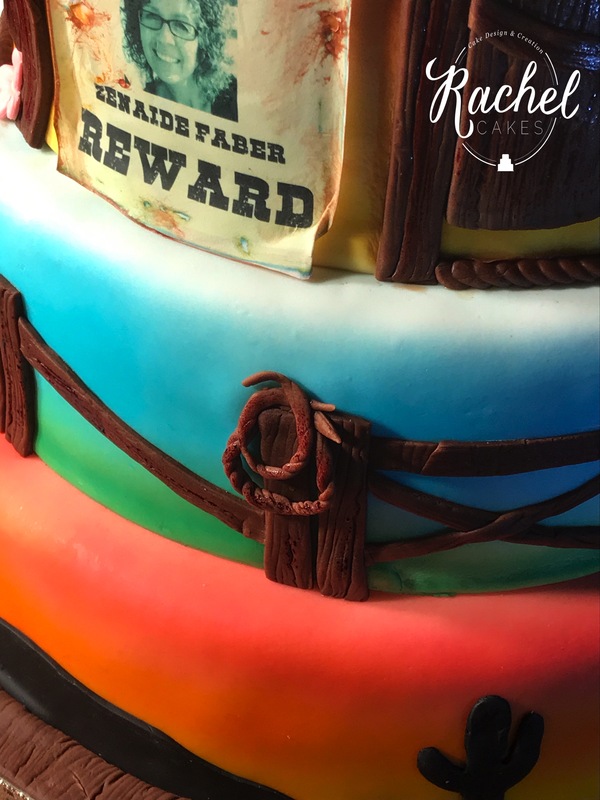 Not that I won’t be willing to do an exact copy of your most favourite design ever viewed on a cake, but I always prefer to give a design my own flair. And starting from scratch gives me a LOT of room for flair. I knew right off the bat (is this a baseball term? I’ve always wondered…….) that I wanted to put Zenaide’s face on a Wanted Poster. Think a little bit Country-Western, a little bit outlaw. Not that she is one. FAR FROM IT! There is apple pie, and then there is Zenaide. This made the contrast all the more wonder ful. Especially since every photo ever taken of this lady has her smiling from ear to ear! Then, rather than do the normal cowboy, horse, boots look I decided I wanted more of an homage to the CW life than icons of the CW life itself. Does that make sense? Perhaps the photos will. 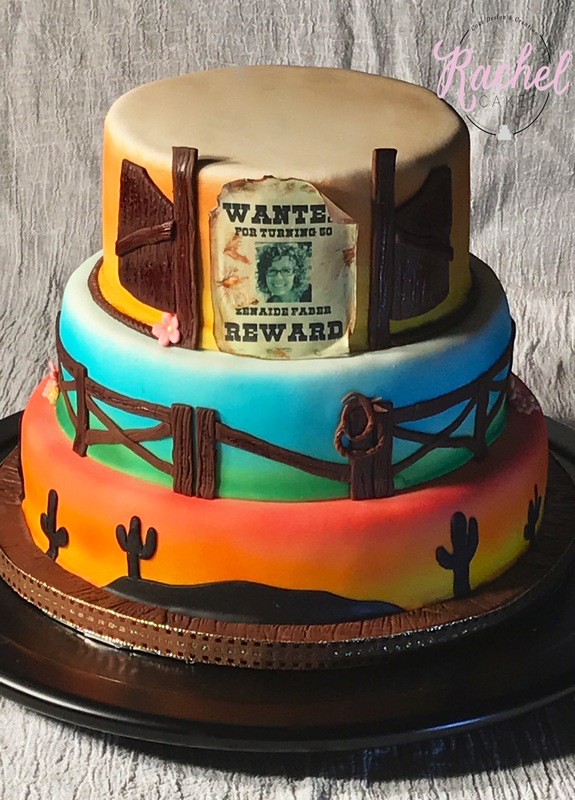 One tier was a cactii display on a sunset background and the middle was a simple country fence with one sole lasso hanging at the gate. Little delicate flowers were dropped all around the bottom of this tier.